FEATHERY cirrus clouds are beautiful, but when it comes to climate change, they are the enemy. Found at high-altitude and made of small ice crystals, they trap heat - so more cirrus means a warmer world. Now it seems that, by destroying cirrus, we could reverse all the warming Earth has experienced so far. 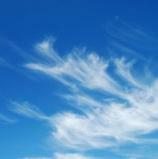 In 2009, David Mitchell of the Desert Research Institute in Reno, Nevada, proposed a radical way to stop climate change: get rid of some cirrus. Now Trude Storelvmo of Yale University and colleagues have used a climate model to test the idea. Storelvmo added powdered bismuth triiodide into the model’s troposphere, the layer of the atmosphere in which these clouds form. Ice crystals grew around these particles and expanded, eventually falling out of the sky, reducing cirrus coverage. Without the particles, the ice crystals remained small and stayed up high for longer. The technique, done on a global scale, created a powerful cooling effect, enough to counteract the 0.8 °C of warming caused by all the greenhouse gases released by humans (Geophysical Research Letters, DOI: 10.1002/grl.50122). But too much bismuth triiodide made the ice crystals shrink, so cirrus clouds lasted longer. “If you get the concentrations wrong, you could get the opposite of what you want,” says Storelvmo. And, like other schemes for geoengineering, side effects are likely - changes in the jet stream, say. Mitchell says seeding would take 140 tonnes of bismuth triiodide every year, which by itself would cost $19 million. Copyright © 2013 Yale University. All rights reserved.